Fear: How deep does its effects go? Chief Yuya shared his insight on fear in a way that was far too complete to simply "blog" about it. The following are merely chips off the jewel he shared. The link to it, as well as the music compilations in which he creatively shared it, can be found at the bottom. Enjoy. Is Fear Damaging Your Internal and External Communities? 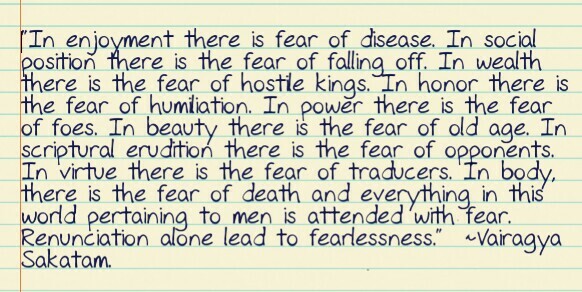 "Fear has to be received as an individual who lives within and who needs to be expelled to the without. It is an entity and an energy that derives itself from and lives within an individual, but should not be perceived as something allowed to stay because of the harmful effects it has not only on the nervous system but on the digestive system, kidneys, liver, and spleen. Fear is more contagious than the worst disease that you could imagine because it not only destroys one's purpose, but also drains the nervous system of it power and energy. The nervous system, as we know, is governed by our Orisha Esu. Now because fear is contagious, having a fearful person within your collective is a dangerous thing to have. Not only that, one who is doubtful and one who is ignorant is just as dangerous. Through fear we accept and receive so many diseases within our body because it has a direct affect on certain organs. It makes us very acidic and the over-acidity is due to the hyper-activity that fear causes on the hypogastric and nemogastric plexus which are connected to your kidney and your spleen. The spleen is also what our bodies use to rid us of our dead blood cells. So the spleen is an Ogun space and its a clearer of old things that we no longer need anymore. Of course, we cannot separate fear from doubt. Nor can we separate fear from anxiety and worry as they are all close relatives of one another. A certain kind of fear is natural, normal. We have our irrational fears which help to preserve our lives as well as the life context which we currently have. We have to determine if the current life context we have is something we want to maintain. If so, then our fear mechanism should work towards that. Fear is one of the main tools and mechanisms of the egoic body and the egoic mind. In fact, one of the tricky things about fear is that its origins are typically traced through our childhood. So that fear type or that fearful neuroses actually takes so long to trace back sometimes, that it lays dormant in the subconscious mind and comes forth at times of panic and stress or when you find yourself within the midst of a crisis. Again, anxiety and worry are the byproducts of fear and it helps fear to be worried and buried inside of the mind. So...we worry ourselves. Fear is something that we tend to feel and partially or mainly because of the psychosomatic effects that fear has. More importantly, fear is something that really comes from the subconscious mind and causes us to sink further and further away from our purpose. Your soul holds your purpose and your soul is the originator of your will or your willpower. So it is certainly fear that is a distractor of spirit because the distractions of spirit are what leads you away from your life's purpose through fear, ignorance and the attachment to the body. We attach to our bodies because they are our vehicles of expression and more so, our vehicles of earthly enjoyment. We enjoy the planet. We enjoy the fullness of life through our bodies and if there is a change in that or we lose that, then we feel we can no longer enjoy the full beauty and power of life. Fear does this. A fearful person is a dangerous person. They should not be allowed or suffered amongst those who are not fearful."